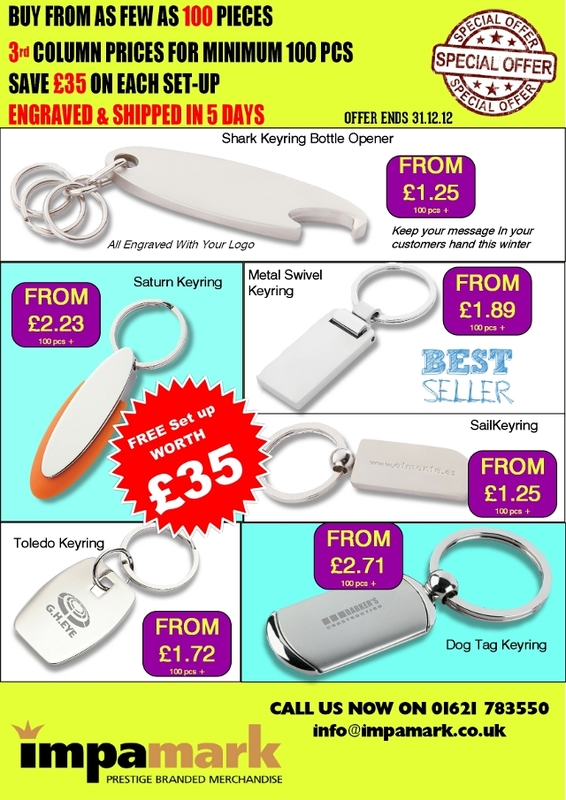 Free setup and low prices on key rings ! More great end of year offers ! Order before 31st December for great prices, low quantities AND free setup. Hurry – don’t miss a bargain. This entry was posted in General and tagged key rings, Personalised Merchandise, promotional on November 29, 2012 by nicky. 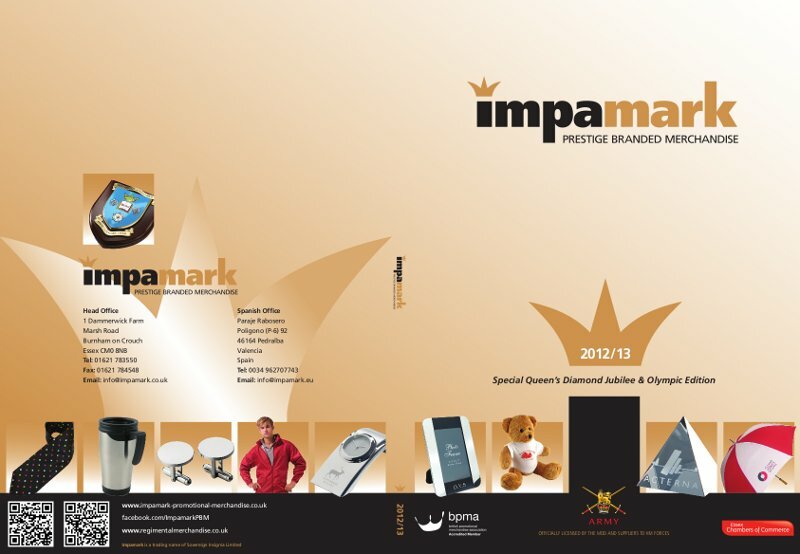 IMPAMARK SHORTLISTED FOR BPMA AWARD! Applicants had to demonstrate that their catalogue cover had high visual impact and that it engaged with the target market whilst reflecting brand identity and brand values. Fellow members will now vote on the final 7. This entry was posted in General and tagged 2012 product catalogue, BPMA, British promotional Merchandise Association, commemorative souvenirs, corporate gifts, Personalised Merchandise, personalised products on November 27, 2012 by nicky. Amazing End of Year Winter Clearance offers ! 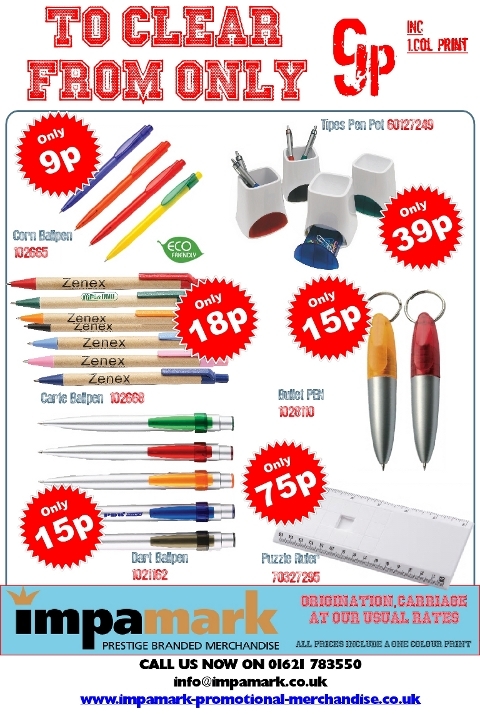 We have some great offers for you on printed pens, pen pots and puzzle rulers. These are Clearance offers so when stock is gone, it’s gone. LOW LOW prices and INCLUDING a One Colour print – excellent for those pre Christmas promotions! Two of the pens are from our environmental range, one is manufactured from corn starch and the other from recycled paper. Only set up and carriage extra – contact us for further details and prices. Don’t miss a bargain ! This entry was posted in General and tagged merchandise, Pens, promotional, Recycled on November 14, 2012 by nicky. How Effective is Promotional Merchandise? Compared with other forms of advertising and promotion a personalised gift represents excellent value for money! Durable – Average promotional item lasts just less than 3 years! How can I use a personalised product within my business or organisation? and FINALLY……. Branded Merchandise is…….. Inexpensive – there is a massive range of items at a low cost!!!!! Branded Merchandise really DOES deliver results!!! This entry was posted in General and tagged Awards and Incentives, BPMA, brand awareness, branded items, branded merchandise, British promotional Merchandise Association, commemorative souvenirs, commeorative gifts & souvenirs, corporate identity, Exhibition Giveaways, member merchandise, Personalised Merchandise, personalised merchandise campaign, personalised products, Presentations, promotional item on November 13, 2012 by nicky.